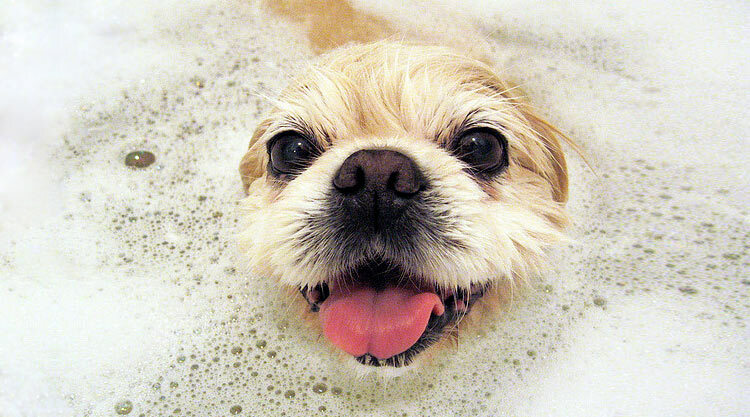 Choose a Bath & Groom Add-On to supplement a Dog Grooming Package. They're designed to address the specific needs of your pet and keep your dog healthy, happy and looking great. Making your dog feel really special by adding brightening or low-shed shampoo, remoisturizing conditioner, teeth brushing and breath freshener. Cologne and a bandana or bow included. Rid your dog of pesky fleas and ticks with instant-relief spray and medicated flea & tick bath. Available as a stand-alone service or added to a bath or groom, this monthly treatment helps prevent fleas and ticks from returning. A neutralizing shampoo and spray that eliminates unwelcome odor. Oatmeal Shampoo, enriched with honey, aloe vera and avocado oils, soothes dry, itchy skin. A mixture of jojoba oil, chamomile and aloe vera whitens light coats and brightens dark ones. Natural safflower oil, essential fatty acids and a silicone conditioner act in harmony to reduce shedding and repair split ends. A healing combination of grapefruit seed extract, apricot and avocado oils and sulfur provide relief from flaking skin, excess oils and scratching. Moisturizes and soothes the skin. Revitalizes and detangles the coat. The result is a softer, shinier coat.